The second rule has a firm basis in the way we will use the atlas data – anything that is confirmed is a solid record no matter what. The first rule, however, simply defers the decision of what to include to us during the data management phase of the project. This is good in that it means we can standardize what gets included and what does not, but we still have to decide when a record is counted as breeding evidence. Sightings outside of safe dates often do indicate breeding, but it is harder to be certain when species are still migrating or moving around. For example, the broad-winged hawk I saw in my yard today might stick around to breed, but it might just have been taking a break before continuing its migration to southern Canada. Consequently, I chose not to submit a breeding code for the hawk even though it was in suitable breeding habitat. Species that are present year-round are even trickier to make decisions about. Many of the white-breasted nuthatches I’ve seen in recent weeks are probably nesting nearby. But, nuthatches are at least somewhat migratory, so how can I be sure about any particular bird? In most cases, I have not entered a breeding code and I figure I will wait until later in the summer when I can be confident the birds are not just moving through. There are exceptions though. If you are not an eBird user, then the notes can be submitted via the projects rare reports form. Clearly one wouldn’t want to go to this much trouble for every singing bird outside of its safe dates. 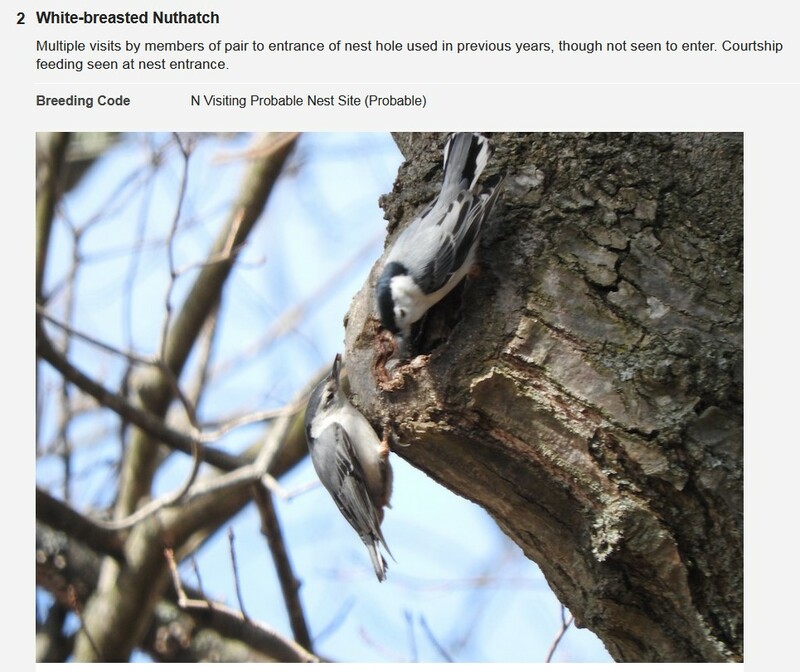 But, if you have an observation that you think provides strong evidence for nesting, even though it is outside the safe dates and doesn’t confirm breeding, providing these supporting details can help to back up the record. For species that are rare or hard to confirm, submitting this information is especially valuable. Previous PostPrevious Where are sapsuckers now?